Data sharing and Big Data have become the trending topics in the financial world of late. With the advent of many Fintech start-ups, traditional banks are undergoing a major shift. They, now, are looking forward to modifying the way they operate, to survive the cut-throat competition from their peers. This is when the idea of Open Banking started doing rounds in the banking arena. What Is Open Banking API? In short, it is an Outbound Trade – Stretching beyond the 4 walls of the bank for better services to the customers. The concept relies on connecting computing systems through a common digital language shared among them with the aid of an Application Program Interface (API). This would increase the level of transparency with respect to data accessibility for end customers. It would also help Fintech firms and other third parties to develop and build financial applications. This, in turn, would help banks and other financial institutions to look beyond their businesses and make innovatory advancement in services for the end users. How Did ‘Open Banking’ Concept Take Flight? Open banking was developed based on an idea of Open Innovation coined by Henry Chesbrough who was the head of Open Innovation, Haas School of Business. He came up with the idea that an information or knowledge doesn’t belong to a singular entity and needs to be shared. This concept was later taken up by the banking sector as ‘Open Banking’ to innovate the way they operate and give a holistic banking experience to its customers. Until recent times, your financial history was closely guarded and protected by your bank. Your data could only be accessed when you use your debit or credit card for certain transactions through the payment processors. Hence unless you are officially validated, you can’t access an individual’s banking history. However, your banking data still found a way to get to other companies who could use it for their business promotion. How was that even possible, you may ask! The only way one could get hold of your financial history was through screen scraping. This was possible by getting your login credentials and using that to access your account for the required data. This was not only unsafe and risky but also highly inconvenient as it gives the said company access to your most confidential information (that could also be misused) and might even lead to frequent blocking of your account (in case of suspicious activity). Hence this needed fixing! The most important part here is the need to control the data that you are willing to share and also the power to revoke it whenever you feel the need to. Open Banking API to the Rescue! To give a control over their data to the customers, banking institutions adopted a newer and updated technology which shared the banking data between the third parties through APIs. This is a sustainable model which is not only reliable but also secure. However, on the flip-side, such advancements may lead to conflicts and need strict governance and policies to control the technicalities associated with such an arrangement. Also, such data sharing systems need high-grade security controls and infrastructural barriers to contain the data privacy. 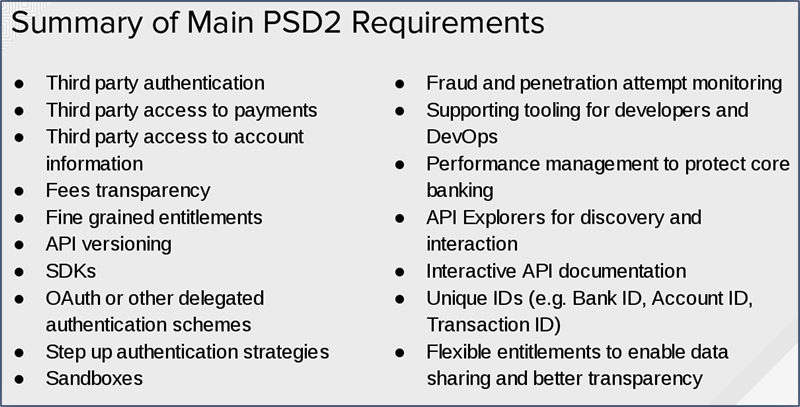 The All-New PSD2 Standards for Data Security! The revised Payment Services Directive or the PSD2 is an upgrade of the existing directive to regulate and control the payment services and service providers in the EU. The main aim for this revision was to minimize conflicts between two or more third parties involved in data sharing and to ensure consumer protection and data privacy. In fact ‘PSD2 + Open Banking and APIs’ is considered as an Engine for Innovation and meaningful change. This directive is said to be of monumental importance in the legacy of data sharing in the retail banking sector. It would control the way the APIs behave and are controlled. They would dictate how third parties connect, share information and the scope of information that can be accessed. By this, the Third Party Providers (TPPs) registered across the participating states can communicate with any bank provided they clear the SCA (Strong Customer Authentication) norms and the data exchange also conforms with the SCA norms. This would mean that every third party involved in data sharing would have to go through diligent scrutiny to verify their authenticity. Well, it’s not only about the Outbound Trade, Open Banking is also about Inbound Trade. It is also about trading the right products and service features seamlessly from Third Party Partners (TPPs) into their own offerings. Importing the full breadth of these products and features enhances personalized customer experience, build customer loyalty and it also lowers bank’s operational costs. With Open Banking, by adding ‘Banking and Non-Banking’ products and features, banks are able to extend their services beyond the ‘traditional zone’ and broaden their approach beyond financial services to complement further as ‘Complete Customer Banking Journey’. Teknospire, a FinTech Company, has helped multiple banks and financial institutions in multiple countries in Africa (Zimbabwe, Mozambique, Zambia, South-Africa), India, Nepal, and Bangladesh. The core mission and vision are to serve the Bottom 2 billion population, who are not on the digital payments platforms yet. To be able to digitally evolve the banks / financial institutions need at least 6-8 different platforms and Teknospire brings them all bundled into one single offering, to cut down the cost, effort, and effectiveness of digital evolution for these institutions. Acknowledged by Oracle, Teknospire offers the ‘plug and play’ solution, FinX, ‘Digital Bank in a Box’, as you call it famously, to connect with ‘the right people’ by extending your technology in the most secure, cost-effective and accountable way for the disbursement of resources to provide financial inclusion to the last mile. ‘FinX ‘ addresses the 360º digitization of banking and payments, especially addressing the last mile, without any extra hardware/capital expenditure. The solution addresses banking, digital consumption of household/VAS micropayments and merchant payments and hence the name “FinX 360º”. Open Banking is definitely a boon for the financial institutions, end-customers and all the associated third-parties that can benefit from the data sharing. Touching upon its various benefits, is our next blog “Open Banking: Who will really get benefitted?” all about. While the benefits and consequences of the PSD2 are yet to be studied in-depth, it can definitely pave the way towards a more streamlined and controlled Open Banking System.